Home >All Reviews>East Coast Travels>East Coast Travels – Excellent experienced driver! East Coast Travels – Excellent experienced driver! Our route was from Kandy to Sigiriya to Ella to Tangalle over 8 days in April 2019. Our driver, Sudarshan, was excellent. My husband and I had such an amazing trip with him. He’s such a nice genuine guy, very professional and really helpful and informative about everything. I found him through the site and sent him through our proposed itinerary with the hotels I’d arranged and he came back with lots of suggestions of what we could do. He was very easy to communicate with leading up to our trip and filled me with confidence (nothing was lost in translation). When we arrived he was waiting for us at the airport and took us straight to Kandy. 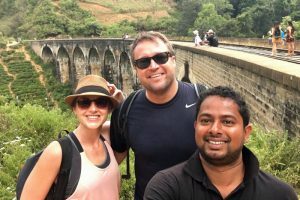 Over the 8 days we got to see lots of amazing sites – Sudarshan has great connections with local amenities (guides, safari, etc) and can act on your behalf to get the best deal possible. He also was very understanding when we just wanted to relax at the hotel too. The car was clean and comfortable with excellent air conditioning. And was easy to relax and sleep during the long journeys. He made sure we were always where we wanted to be in good time. And he always rang ahead to our hotels and activities to ensure they were prepared for our arrival to make everything really seamless and comfortable. In a foreign country he always made us feel safe and welcomed us to the beauty of Sri Lanka. He was certainly a fond part of our experience. We highly recommend him and will be doing so to all our friends coming to Sri Lanka. We will almost certainly be returning ourselves! See more information and photos of East Coast Travels or Send Message.